﻿ 10 Premium Responsive Bootstrap Templates - only $10! Giving your old site a facelift? Not to worry! What you need is a simple yet elegant solution. Less is certainly more, and that’s exactly what you’ll get from a Bootstrap responsive template. 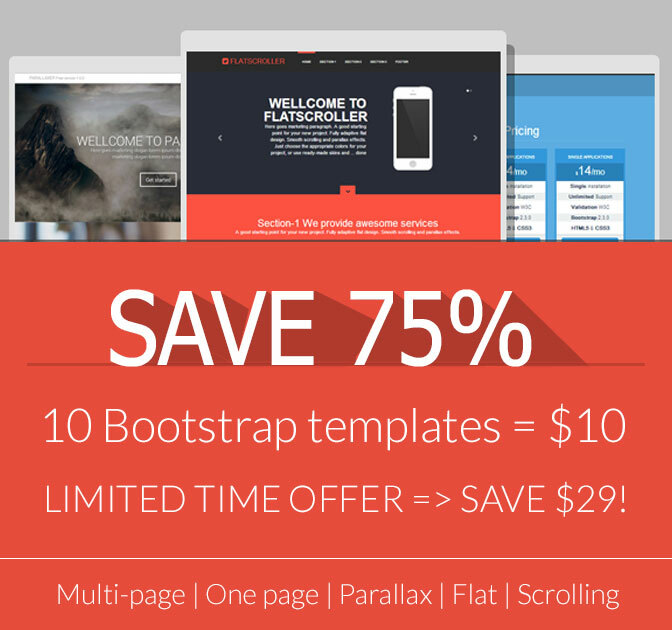 But with this Mighty Deal, you won’t get just one measly Bootstrap template. Not even 5 Bootstrap templates. No, what you’ll get is a collection of 10 HTML5/CSS3 Bootstrap responsive templates all ready for you to integrate into your glorious website! And you’ll get them for 75% off! Normally, this set of 10 Bootstrap responsive template costs just $39. That’s a steal unto itself! But for a limited time only, because you’re buddies with us here at Mighty Deals, you can save a whopping 75% off that already-low price! That’s right, pay just $10 for all 10 templates! That’s like paying $1 per template! Click the BUY now button and strap yourself in as you get ready to take your website to new heights!